Paul G. Harris (ed. ), Global Warming and East Asia: The Domestic and International Politics of Climate Change (Routledge, 2003). Global Warming and East Asia analyses the domestic politics, foreign policy and international relations of climate change in East and Southeast Asia. The countries of this important region are often disproportionately affected by climate change and, as they expand and develop, their contribution to the problem grows. The contributors investigate the increasingly widespread and disparate efforts to address global warming at international, national and local levels, and in so doing increase our understanding of a region vital to mitigating and coping with climate change. 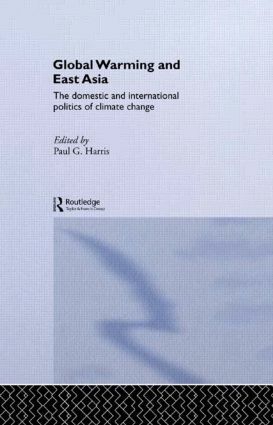 This unique volume includes in-depth studies of China and Japan, two of the most important countries in East Asia with regard to global warming, and examines the role of East and Southeast Asian countries, such as Indonesia and the Philippines, in combating the problem.